Features: Threaded Barrel. Collapsible Stock. MBUS Sights. Finally Here! Fans of the popular Kel-Tec PMR 30 Pistol will love this semi-automatic carbine that uses the same magazines! Designed for compact, lightweight, low recoil accuracy, the CMR-30™ features a single action trigger, bolt stop, ambidextrous safety levers and magazine catch similar to the popular PMR-30 pistol. It also uses the same 30 round, .22WMR magazine. A collapsible stock reduces its 30.6 inch overall length to 22.7 inches. Comes with Magpul MBUS Sights. The CMR-30 will redefine your idea of accuracy. Features: Bull-Pup Desing. Totally Ambidextrous. FAL Magazines. Rail. 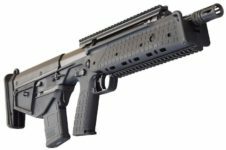 Condition: New In KEL-TEC Case! Finally back in the store! 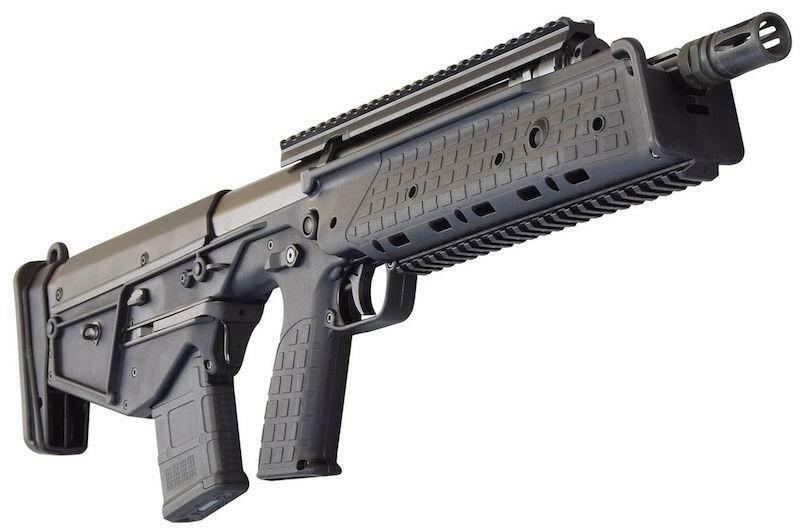 The vey hard to get Kel-Tec RFB24 TAN (we are allocated one a year)! RFB stands for Rifle Forward-ejecting Bullpup. Forward-ejecting allows the RFB to be the first truly ambidextrous 7.62 NATO Bullpup. The patented, dual-extractor system maintains control of the case from the moment it leaves the magazine and upon firing, pulls the fired case from the chamber and lifts them to push them into an ejection chute above the barrel, where they exit. The RFB is a short-stroke gas piston operated semi-automatic rifle in 7.62 mm NATO caliber. All controls are fully ambidextrous; the reciprocating operating handle can be switched to either side. The safety disconnects the trigger and blocks the hammer action. 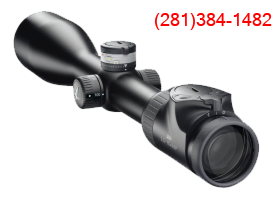 This version, with a 24″ barrel, allows maximum muzzle velocity for the 308/7.62 cartridge. The Bullpup configuration and tilting-block mechanism allows the 24″ model to be only 31″ long, or as much as 14″ shorter in overall length than its competitors with equal barrel lengths. The stock and mechanism cross-section is similar to a conventional rifle, in stark contrast to existing Bullpup rifles. The RFB is also the safest Bullpup developed because the breech is separated from the shooter’s face by two layers of 1.6 mm steel. In the highly unlikely event of a case rupture, gas expansion is directed downwards through the magazine well to protect the shooters head and face. The barrel has a chrome-lined bore and chamber, threaded muzzle (5/8×24 TPI), and comes equipped with Keltec’s A2-style Flash Hider. A Mil-Spec Picatinny rail is attached rigidly to the barrel. It accepts standard metric FAL type magazines which work “drop free” and do not need to be tilted in. One 20-round magazine is included, and the RFB comes with a two point sling that can be easily configured to suit the user’s preference. INCLUDES A KEL-TEC HARD CASE! Features: Bull-Pup Design. Totally Ambidextrous. FAL Magazines. Rail. Finally we get one again! The vey hard to get Kel-Tec RFB18! RFB stands for Rifle Forward-ejecting Bullpup. Forward-ejecting allows the RFB to be the first truly ambidextrous 7.62 NATO Bullpup. The patented, dual-extractor system maintains control of the case from the moment it leaves the magazine and upon firing, pulls the fired case from the chamber and lifts them to push them into an ejection chute above the barrel, where they exit. The RFB is a short-stroke gas piston operated semi-automatic rifle in 7.62 mm NATO caliber. All controls are fully ambidextrous; the reciprocating operating handle can be switched to either side. The safety disconnects the trigger and blocks the hammer action. The Bullpup configuration and tilting-block mechanism allow the 18″ model to be only 26.1″ long, or as much as 14″ shorter in overall length than its competitors with equal barrel lengths. The stock and mechanism cross-section is similar to a conventional rifle, in stark contrast to existing Bullpup rifles. The RFB is also the safest Bullpup developed because the breech is separated from the shooter’s face by two layers of 1.6 mm steel. In the highly unlikely event of a case rupture, gas expansion is directed downwards through the magazine well to protect the shooters head and face. The barrel has a chrome-lined bore and chamber, threaded muzzle (5/8×24 TPI), and comes equipped with Keltec’s A2-style Flash Hider. A Mil-Spec Picatinny rail is attached rigidly to the barrel. It accepts standard metric FAL type magazines which work “drop free” and do not need to be tilted in. One 20-round magazine is included, and the RFB comes with a two point sling that can be easily configured to suit the user’s preference.